Update: This post is for the old Blogger classic template which is no longer supported by Blogger.com. Also update at bottom of page. Edit the other links. If you want more links, you can always copy and paste the links and edit them to what you want. Update 2: I just realised that while the link list you are supposed to edit are present in nearly all the standard Blogger templates, some (like the Sand Dollar and Scribe template I think) doesn't have them. Check for this in the sidebar of your blog. into the appropriate part of your template and edit it according. You can refer to his post Adding content to your blog via the template as a guide as to which part of the template you should add the HTML. The post shows text as an example, but it can be HTML, scripts for ads, hit counters, etc. Note: Following the instruction above will result in your link list displayed in the main page and also in the archives. If you want the link list to appear in all pages, remove the <MainOrArchivePage> and </MainOrArchivePage> tags from the HTML. UPDATE 19 August 2008: This post was prepared before the introduction of New Blogger and is meant for those using old classic Blogger template. 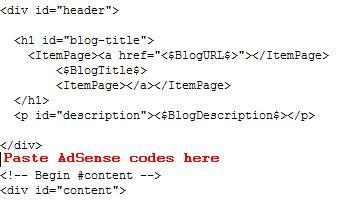 For New Blogger xml template, please refer to adding advertisements and hit counter to New Blogger blog. Many bloggers are interested in knowing how often their blog was viewed. What you need is a hits counter. You can get a free hit counter here at StatCounter.com. After you sign up for an account, you will be taken through a series of steps to generate codes to paste into your template. You will have to provide a title and give the url of your blog, choose a category and select from a series of options. You may just accept the default if you want a counter similar to what you see at the bottom of this page (you may also select the invisible option). There will be just one option where no default is given and that is whether your website uses frames. Select NO. There is a further option of whether you want the script generated for your counter to be XHTML compliant or not. For the New Blogger, I have earlier found that leaving this unticked can give a working counter. But if you are using a New Blogger template, it is probably betting to tick that option. When the codes are generated, highlight it and copy the codes. 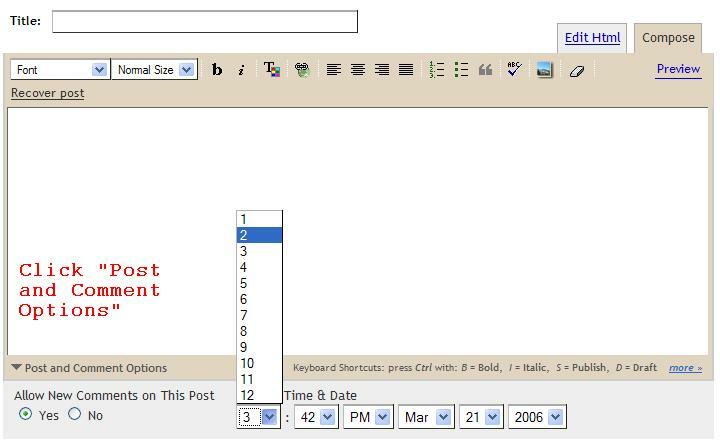 Sign into Dashboard, select the relevant blog, click the TEMPLATE tab to get to the template editor to edit the template. 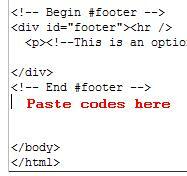 Paste the codes after the <body> tag and before the </body> tag. 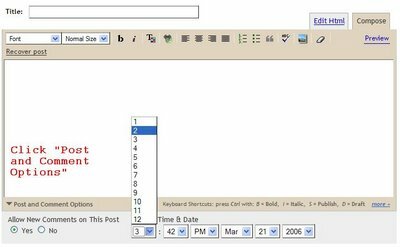 If you chose an invisible counter, you can follow the instruction in the post exactly, and it doesn't matter whether you are using the old classic template or the New Blogger template. If you chose a visible counter, the counter will appear at the bottom of the page. 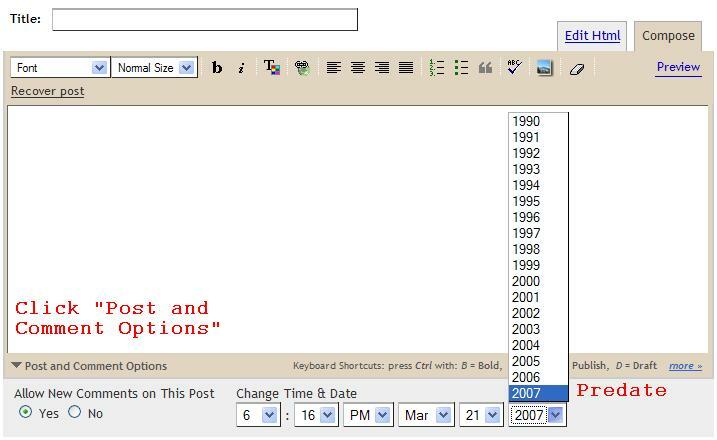 If you want the visible counter to appear elsewhere and you are using the old classic Blogger template, you will have to refer to this post Blogger template tutorial (old classic template): Adding stuff via the template for a guide as to where to paste the script. For New Blogger template, see update. To delete photo, you will have to remove the relevant html code that has the tag that look something like this: <img src="photo.jpg"> while in the Edit Html mode. An easier way is to do it in the Compose mode. The above only stop Blogger from displaying the photo. If you want the photo to be completely deleted, you will have to sign into Picasa Web Album and delete it there. Appreciation to Prof. Jong-Seung Park for reminding me of that oversight. 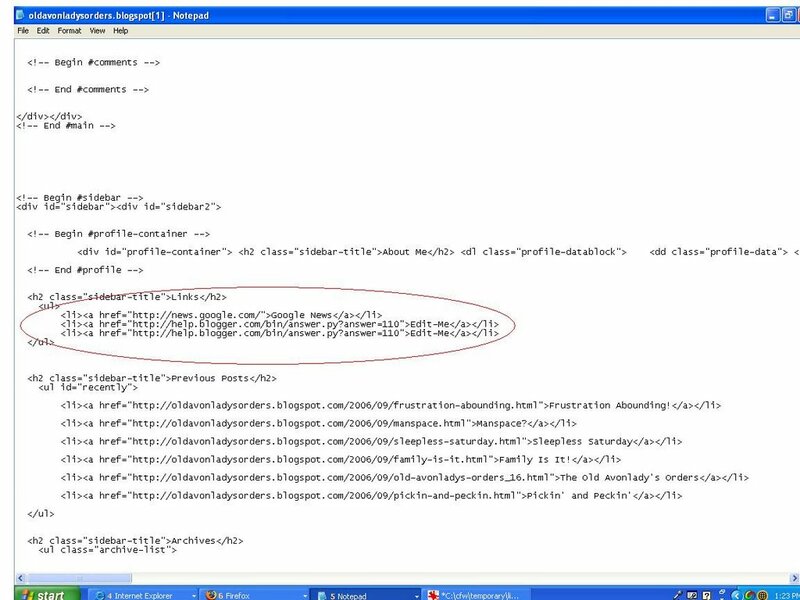 To write a hyperlink which open in the same window, the HTML tag is of the form <a href="URL of target site">Description</a> Replace Description with a description of the target site. That description is referred to as an Anchor text and is important if you are linking to other part of your own site as this Anchor text will let the search engines know what that post is all about and will make it easier for people searching for topics contained in that post. It is also what people will see in your site. 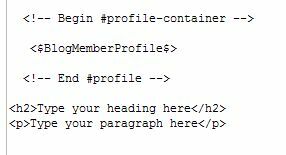 For example this HTML tag <a href="http://blogger-tricks.blogspot.com">Blogger Tips and Tricks</a> will be seen as Blogger Tips and Tricks. The "Description" is what people call the anchor text and to read about the importance of anchor text, go to Importance of anchor text in hyperlinks. In shout, don't ever put the anchor text (Description) as "here" if possible. 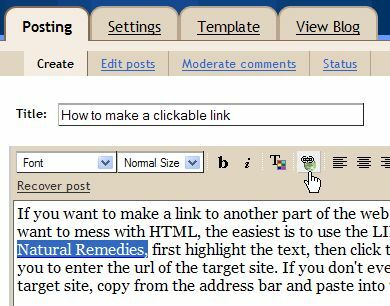 If you want to make a link to another part of the web or to another post in your blog, and you don't want to mess with HTML, the easiest is to use the LINK icon in the post editor tool bar. For example, to link to Natural Remedies, first highlight the text as shown in the screenshot above, then click the LINK tool. A pop-up box will appear for you to enter the url of the target site. If you don't even want to type the url, you can go to the target site, copy from the address bar and paste into the pop-up box, then click OK. This will be best done with a browser with tabbed browsing like FireFox. 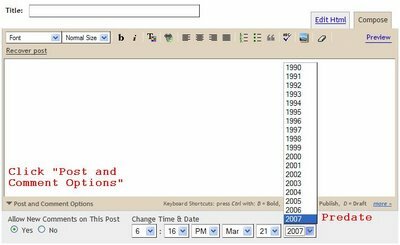 Then you can be in the post editor page of Blogger in one tab and the site you want to link to in another tab, all in the same window, and you can easily go from one tab to another by clicking on the tab which will give information about what is in that tab. The link HTML tag will automatically be written for you. The link will open in the same window, and you will not have the choice of making the link open in a new window. You also will not have what they call a tool tip which appear when you hover your mouse over the link and which will give information about the site you are linking to. Refer to the relevant section if you want that. Will display the link Dummies Guide to Google Blogger. Try hovering your mouse over the link and observe (looks like there is a limit of how much information you can put in the title attribute because in Firefox 2.0, the information I put in was truncated in the tool tip. I checked in different browsers and in Flock, it was also truncated, but in Internet Explorer 7 and Opera, the information was displayed in full. Thus if you are interested in how visitors using different browsers, it is a big advantage to have many browsers in your computer. There are lots of other advantages as well. See Why you should be using more than one browser). It does your computer no harm to have more than one browsers in your computer. Update 9 May 2007: For linking from one part of the post to another part of the post in the SAME page, refer to How to enable your visitors to jump from one part of a page to another part in the same page. For linking from one part of a post to another part in ANOTHER post, see How to link from a spot on a page to another spot in ANOTHER page. Question: " When we are in the compose mode, we double space between paragraphs. It looks fine. When we go to the preview mode, there are no space between the paragraphs - everything is smashed together. What is happening?" You can type as many <br /> as you want line breaks. 5. Select number of posts to display on main page.